NitroTap Replacement Cansiters are sold in sets of 4. These can only be use with the NitroTap Wine Service & Preservation Systemor Winekeeper preservation systems. What is the composition of gasses in the canister? BEST ANSWER: The canisters contain Nitrogen, a completely inert, non-toxic gas. Consequently, it has no impact on the wine. Kiyoshiss, these are Nitrogen gas canisters. The canister says nitrogen, compressed. Will this work with “Wine Keeper” regulator? BEST ANSWER: Yes, I think so. Wine Keeper was the forerunner to this regulator system. Better look at the images to be sure. Yes it will. I use them all the time with my Wine Keeper system. i have a Vintage Keeper wine siphon system that uses an 18L bottle of 50% nitrogen and 505 CO2. Can I use these bottles with that system? BEST ANSWER: I'm not sure, but probably. The Wine Keeper and Nitrotap gas bottles seem to be interchangeable, at least for the single wine bottle system. You need to compare the wine bottle dispenser and pressure regulators for the 2 types of systems. I use the single bottle system. The previous answer seems accurate as to how they are interchangeable. Why so costly to ship? Also will the unused canisters remain sealed or can they leak? Past experience was that several were "empty" when it came time to use them. Maybe they were not properly filled? It's the reason I stopped using the system several years ago. Now thinking of trying again. BEST ANSWER: The shipping is higher on the canisters because they ship as hazardous materiel, thus the higher shipping rate. BEST ANSWER: A while ago they used to do a single cannister and it was just not cost effective for the customer as you pay hazmat fees. So they only do a set of 4 now. Approximately how many 750ml bottles will one canister last for? BEST ANSWER: Each cylinder will dispense 15L of wine! Best way to finish a large bottle of wine that can't be finished in one sitting. I have had good experience with NitroTap canisters over the past 25-30 years saving many bottles of wine from deteriorating during that time. It keeps a red wine fresh for up to 2 weeks. Couldn't afford great wines without it. Lifesaver if you have 5 liter bottles! Love the tap system for 5 liter bottles. The canisters last a long time, and are very easy to change when needed. Amazing how much easier it is to serve from a 5 liter when it's the house favorite! Less work, glass to recycle, time, money...WOOOHOOOOO!! We are big wine consumers and this product helps us keep open bottles in drinking condition for days. This preservation system saves us money because we don't have wine that goes bad and must be thrown away. If you are someone who likes to sample different wines and/or does not consume an entire bottle in one go, this product will make good sense for you. I wish there were more attractive housings available to hide the canisters. For some reason the top of the canister no longer will allow me to screw in my old Winekeeper. It works; but I have to hold the Winekeeper in place while I fill a glass. Other than that I really like it as it will keep the wine fresh for 4 to 5 days. 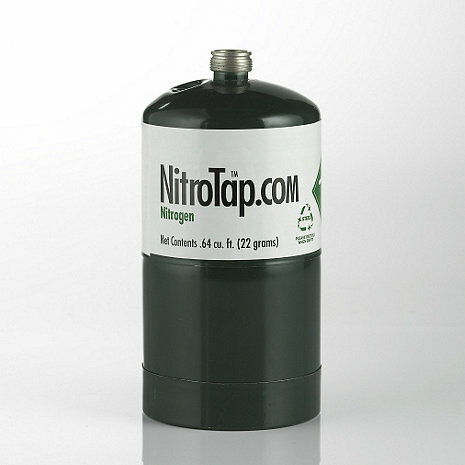 I've had the nitro tap for years and just ran out of nitrogen. Unfortunately WE only sells nitrogen canisters in 4pks which makes sense for an on premise account but is excessive for a consumer...a two pack suite my needs. 1.THEY DON'T LAST LONG TIME. 2,THEY ARE TO MUCH MONEY. If you are like me; you open a bottle of wine, have a glass or two one night, a glass the next night and then have to pour the rest down the drain. This product really stretches out the life of the wine. I get at least another day, or two, out of a bottle.